Sixth graders at South Ridge Elementary School are excited. Not only did they attend an advanced movie screening of the film “Wonder” this week at a local theater, but they also got a chance to interact afterwards with the cast and film crew via live streaming video. The official release of the movie is scheduled for November 17. 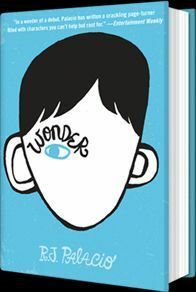 The film is based on R.J. Palacio’s book, “Wonder,” a novel that tells a story of Auggie Pullman, a tough, sweet 10-year old boy born with distorted facial features and his struggle to be treated normally. 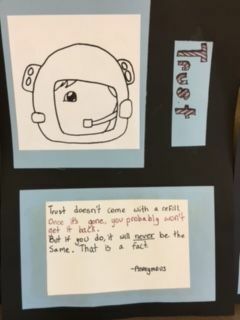 Told from Auggie’s point of view and from the perspective of others, the story describes how one community struggles with empathy, compassion and acceptance, teaching the reader these qualities as well. The challenge, now in its third year, is sponsored by LionsGate Films, Gap Kids, Walden Media, Participant Media, and Random House Children’s Books. 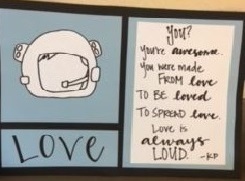 To qualify for the certification, classrooms participate in any of three different activities that help students explore kindness in daily life. Special prizes are awarded as incentives for the students. South Ridge’s sixth grade classes chose to participate in all three activities. 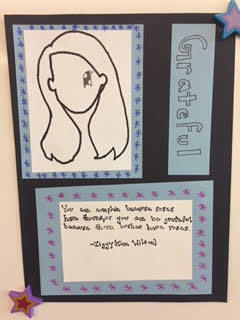 This activity was inspired by a character in the novel, Auggie’s English teacher, Mr. Browne, who introduces his students to his personal precepts--kindness, hopefulness, the goodness of human beings, the strength of people’s hearts and the power of people’s wills. 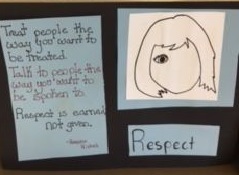 This activity asked students to identify their own original principles to live by and the ways they “Choose Kind” on a daily basis. In early October, South Ridge Elementary School sixth grade teachers Cheryl Shaw and Linda Wear received the news that their classrooms were chosen as Activity #2 winners. Their classrooms won 50 tickets to the advanced movie screening along with an option to purchase additional tickets, making it possible for all of South Ridge Elementary’s sixth graders to attend as well. The classroom challenge continues. The sixth graders are currently working on Activity #3 to “Fill a Jar with Kindness,” which asks students to fill a jar with a small object (like marbles) each time an Act of Kindness occurs in the classroom. Submitting a photo of the filled jar qualify them for prizes as well. Winners of this challenge will be announced in April 2018.